We have already talked about via della Ninna (the Lullaby street), the street that was opened beside the Palazzo Vecchio, when the Uffizi Palace was built. At that time, the church of San Pier Scheraggio has been destroyed: it had been a very important church in town, the priory of one of the Florence sestieri (the ancient name of its six districts). The Romanesque church – consecrated in 1068 – was a little artistic jewel. It hosted the Madonna della Ninna by Cimabue, that gave name to the via della Ninna. The name Scheraggio has originated from the schiaraggio ditch, that ran alongside the first city walls. The church had a very central role in the social life in Florence: it was the place where gonfaloniers and priors were elected, before the town hall had been built. In its naves, during several important assemblies, people like Dante and Boccaccio made their orations to the town. A first demolition took place in 1298: when Palazzo Vecchio was built, the nave in which there was the Madonna della Ninna was destroyed. In 1410 there was a second demolition. In 1560, when Giorgio Vasari built the Uffizi Palace, the church of San Pier Scheraggio was incorporated in the building and lost its little cemetery and its bell tower. However, until 1782, religious functions took place in the church. Later, it became the Courts Archive. The church was closed for a very long time: it was opened to the public only in special occasions. In 1971, an important restoration disclosed its treasures. The stratifications of the archaeological site revealed the remains of a more ancient church, some Roman frescoes and a staircase. Nowadays the former church is one the Uffizi Gallery rooms. In via della Ninna we can admire some of its columns and the arches of a nave, but also part of the basis. 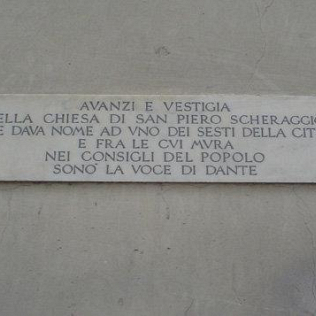 On the wall there is a plaque, in which it is written: “These are the remains / of the church of San Pier Scheraggio / that gave name to one of the sestieri of the town / inside its walls during people\'s assemblies / Dante’s voice resounded”.